All County Air Conditioning, Refrigeration & Heating Company provides excellent customer service. We diagnose any problems you have with your existing system, and if needed install new high efficiency system(s) in your home. We service and offer all brands of equipment that is best suited for your home and comfort as well as your wallet. We take into consideration your personal needs within your home and we address them, building a completely custom indoor comfort system for you and your family. Our service techs are NATE-Certified (North American Technician Excellence) in air conditioning, heat pump, and air distribution, and they receive on going education from equipment manufacturers. 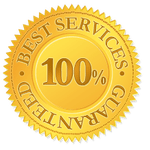 They are some of the BEST and most highly-trained HVAC service technicians, ready to work with you to help resolve any equipment issues you may be having. You’ll always be quoted a price before the work is started, this way you know what to expect. We do not charge by the hour, we charge a FLAT RATE pricing only.